The catalog description for this course was in error. This course provides 12.5 contact hours. 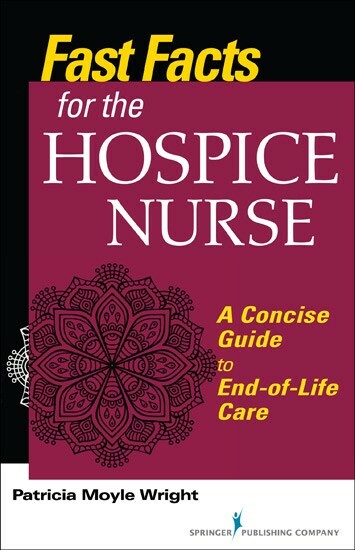 A handy reference for hospice nurses and those interested in end-of-life care, this practical guide covers the essential elements in the compassionate and holistic care of terminally ill patients and their families. Nurses care for patients facing end-of-life issues in every practice specialty and, as the U.S. population continues to age, the need for proficiency in end-of-life skills will become increasingly important. Fast Facts for the Hospice Nurse: A Concise Guide to End-of-Life Care provides emotional, administrative, and palliative support, whether in a hospice, long-term care facility, or acute care setting. This text clearly and concisely lays out not only how to care for patients facing end-of-life issues, but also how to engage in self-care and cope with occupational stress. Organized within the context of the scope and standards of practice of the Hospice and Palliative Nurses Association. "The textbook provided much-needed information as well as 'pearls' to take away." "What a great little book! It’s so user-friendly." "The textbook was clear and straightforward." "Although I am a critical care nurse, I gained a lot of insight from the course." "This text was an excellent resource and had well-organized content." "The textbook was very user-friendly. Easy to read. Great information presented." "Great course. I would recommend it to all nurses even if they are not specializing in the hospice field." "I did not have any questions or comments because I would not change anything! I thought the book and test were great." "Appreciate the contact information for organizations and other resources." "I’m glad you included a discussion about lateral (horizontal) violence and workplace bullying. I have seen this in many nursing situations, but I personally did not experience or observe bullying in my hospice work. That may be why hospice work for me was the most satisfying." "Found the book informative. Liked the 'in a nutshell' concept." "I work with many cancer patients and children with brain tumors. The self-care sections of the book are excellent."